Here is a poll about what are the concerns for people about privacy. 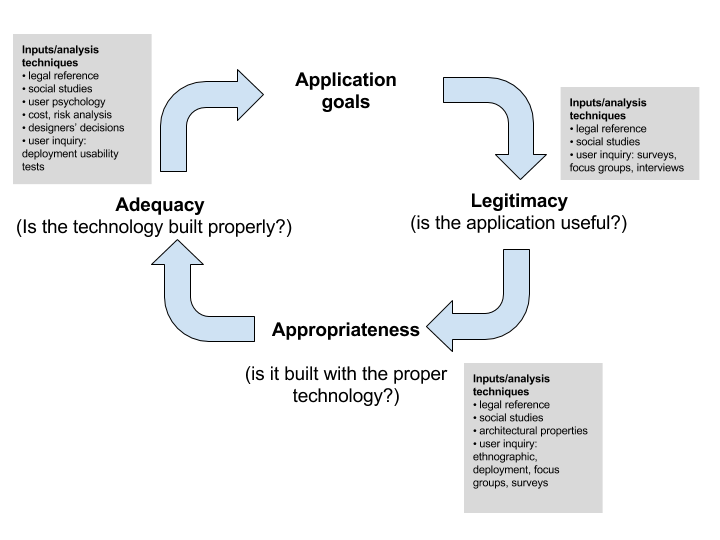 Eva Lenz, Sarah Diefenbach and Marc Hassenzahl proposed the Interaction Vocabulary, obtained after evaluating different interactions through the why-, what- and how- framework (a simplistic form of Goal Oriented Analysis). Esteem, focus on the interaction itself, significance of the present moment, relaxing, calming, accuracy, care, appreciation of interaction/product slow fast Animating, stimulating, activating, efficiency, focus on instrumental goal of interaction, expression of willpower. Instant feedback makes own effect experiential, competence, feeling of own impact creates a feeling of security, you see what you do, makes immediate correction possible, nothing in between, you experience what you do, increase of competence, the instant feedback creates a feeling of recognition. instant delayed Emphasizing the moment of interaction, creating awareness. Centering on the interaction itself rather than its instrumental effect. E. Lenz, S. Diefenbach, and M. Hassenzahl, “Exploring relationships between interaction attributes and experience,” in Proceedings of the 6th International Conference on Designing Pleasurable Products and Interfaces, 2013, pp. 126–135. This entry was posted in HCI on January 17, 2018 by alfredo. Legitimacy: Verify that the application is useful to the user. What is the function that the application cover? Appropriateness:Analyse if the alternative implementations with the different technologies satisfy the goal of the application without supposing a risk for the privacy of the users? Adequacy: Analyse if the different alternative technologies are correctly implemented. G. Iachello and G. D. Abowd, “Privacy and proportionality: adapting legal evaluation techniques to inform design in ubiquitous computing,” in Proceedings of the SIGCHI conference on Human factors in computing systems, 2005, pp. 91–100. This entry was posted in privacy on January 10, 2018 by alfredo.